Aurora (Russian: Авро́ра, tr. Avrora; IPA: [ɐˈvrorə]) is a 1900 Russian protected cruiser, currently preserved as a museum ship in St. Petersburg. Aurora was one of three Pallada-class cruisers, built in St. Petersburg for service in the Pacific Far East. All three ships of this class served during the Russo-Japanese War. TheAurora survived the Battle of Tsushima and was interned under U.S. protection in the Philippines, eventually returned to the Baltic Fleet. The second ship, Pallada, was sunk by the Japanese at Port Arthur in 1904. The third ship, Diana, was interned in Saigon after the Battle of the Yellow Sea. One of the first incidents of theOctober Revolution in Russia took place on the cruiser Aurora. Soon after completion, in November 1903, Aurora received orders to sail with a group of reinforcements to the Russian Pacific Fleet. However, she suffered from repeated mechanical failures and had to be repaired at several ports along the way. When word was received of the start of the Russo-Japanese War while at Djibouti, she was detached from the reinforcement fleet and sent back to the Baltic. After refitting, Aurora was ordered back to Asia as part of the Russian 2nd Pacific Squadron, a collection formed from the Russian Baltic Fleet, under the command of Vice-Admiral Zinovy Rozhestvensky. On the way to the Far East, Aurora sustained light damage from confused friendly fire in the Dogger Bank incident, which resulted in the fatality of the ship’s chaplain. On 27 and 28 May 1905, Aurora took part in the Battle of Tsushima, along with the rest of the Russian squadron. During the battle, her captain, Captain 1st rank Eugene R. Yegoryev was killed, along with 14 crewmen. The wounded executive officer, Captain of 2nd rank Arkadiy Konstantinovich Nebolsine took command. After that Aurora, covering other, much slower Russian vessels, became theflagship of Rear-Admiral Oskar Enkvist, and with two other Russian cruisers broke through to neutral Manila, where she was interned by American authorities from 6 June 1905 until the end of the war. In 1906, Aurora returned to the Baltic and became a cadet training ship. From 1906 until 1912 the cruiser visited a number of other countries; in November 1911 the ship was in Bangkok as part of the celebrations in honour of the coronation of the new King of Siam. During World War I Aurora operated in the Baltic Sea performing patrols and shore bombardment tasks. In 1915, her armament was changed to fourteen 152 mm (6 in) guns. At the end of 1916, she was moved to Petrograd (the renamed St Petersburg) for a major repair. The city was brimming with revolutionary ferment and part of her crew joined the 1917February Revolution. A revolutionary committee was created on the ship, with Aleksandr Belyshev elected as captain. Most of the crew joined the Bolsheviks, who were preparing for a Communist revolution. At 9.45 p.m on 25 October 1917 (O.S.) a blank shot from her forecastle gun signaled the start of the assault on the Winter Palace, which was to be the beginning of the October Revolution. In summer 1918, she was relocated to Kronstadt and placed into reserve. In 1922, Aurora was brought to service again as a training ship. Assigned to the Baltic Fleet, from 1923, she repeatedly visited the Baltic Sea countries, including Norway in 1924, 1925, 1928 and 1930, Germany in 1929 and Sweden in 1925 and 1928. During the Second World War, the guns were taken from the ship and used in the land defence of Leningrad. The ship herself was docked in Oranienbaum port, and was repeatedly shelled and bombed. On 30 September 1941 she was damaged and sunk in the harbour. After extensive repairs in 1945 - 1947, Aurora was permanently anchored on the Neva in Leningrad (now St Petersburg) as a monument to the Great October Socialist Revolution and in 1957 became a museum-ship. On 2 November 1927, Aurora was awarded the Order of the Red Banner for her revolutionary merits and on 22 February 1968 the Order of the October Revolution. The latter features the image of the cruiser herself. As a museum ship, the cruiser Aurora became one of the many tourist attractions of Leningrad (now Saint Petersburg), and continued to be a symbol of the October Socialist Revolution and a prominent attribute of Russian history. In addition to the museum space, a part of the ship continued to house a naval crew whose duties included caring for the ship, providing security and participating in government and military ceremonies. The crew was considered to be on active duty and was subject to military training and laws. Having long served as a museum ship, from 1984 to 1987 the cruiser was once again placed in her construction yard, the Admiralty Shipyard, for capital restoration. During the overhaul, due to deterioration, the ship's hull below the waterline was replaced with a new welded hull according to the original drawings. The cut off lower hull section was towed into the Gulf of Finland, to the unfinished base at Ruchi, and sunk near the shore. The restoration revealed that some of the ship parts, including the armour plates, were originally made in Britain, which put in doubt the previously maintained image of the cruiser as a marvel of authentic Russian naval engineering. Aurora stands today as the oldest commissioned ship of the Russian Navy, still flying the naval ensign under which she was commissioned, but now under the care of the Central Naval Museum. She is still manned by an active service crew commanded by a Captain of the 1st Rank. In January 2013, Russian Defence Minister Sergey Shoygu announced plans to recommission the Aurora and make it the flagship of the Russian Navy due to her historical and cultural importance. On 21 September 2014, the ship was towed out of St. Petersburg to be overhauled at the Admiralty Shipyard. It is planned that she will return to St Petersburg in 2016, ahead of the centenary of the October Revolution. Ogonjek was a model company based in Russia. This kit appeared back in the 70’s and I think they went out of business since. This kit came in a flimsy card board tray and lid type box. It was not shrink-wrapped and was held shut with just tape. The box art is a photo of the model made up and unpainted and posed against an all red background. All the text on the box is in Russian. The kit contains 2 grey trees of parts in an un-sealed cello bag and the instructions. The instructions consist of a single sheet folded in the center to create 4 pages in 8 ½” x 12” page format. It is printed on poor-quality news print type paper. Page 1 of the instructions has a profile line drawing of the Aurora with all Russian text. Page 2 begins with what I believe is the history of the Aurora in Russian only, followed by more Russian text. Page 3 has a full ;page exploded drawing for assembly of the majority of the model. Page 4 has another exploded drawing to use for assembly of the masts and life boats. The bottom of page 4 has what I think are the identities/names of all the parts in the kit. There are 56 parts listed, all in Russian. The second grey parts tree holds: the deck, funnels, turrets, guns, life boats, mast parts, anchors, cabin roofs etc. (85 parts) 3 parts have broken off this tree due to friction against the other tree. There are 2 nameplates that say AURORA on this tree also. One is in English the other in Russian. I bought a B.E.C.C. brand cloth pre-revolution Russian naval flag. 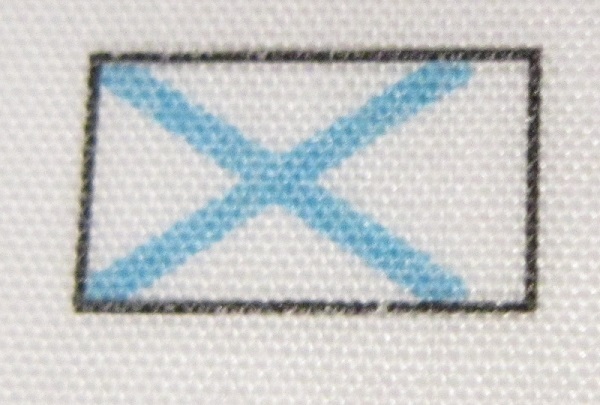 It is white with a blue X spanning it to add to this model. I got this model in trade with a modeler in Krakow Poland years ago. He sent me 3 different ship models in similar flimsy boxes. The other two are reviewed here on Indy.